This page index features our creative games offered and an example of each game. We have 6 different packages to choose from (Including the ALL NEW NERF LASER TAG) to fit your particular party needs. Our Premium Package includes 75 min. of games and up to 20 players, we provide all the Nerf Guns, 500-600 Nerf bullets and team jerseys. Safety glasses are now included and required to be worn by all players. Many of the games use an "American Ninja Warrior" type buzzer if they complete the course! The Ultimate Package provides a longer duration - 90 min, up to 30 players, we provide all the Nerf Guns, 700-800 Nerf bullets and team jerseys. Safety glasses are included! This package includes the same games and battles you will find in other packages! We generally arrive 30-45 min prior to the start of the party to set up all the equipment. We go over all the safety rules with kids and all participants must wear safety glasses (BASIC PACKAGE - glasses are $1 each and yours to keep). Glasses are free with the PREMIUM and ULTIMATE packages. We teach sportsmanship, fair play and integrity through our various games! If you are looking for the latest in Laser Tag, Nerf has come out with Laser Pro Ops Alphapoint and Laser Pro Deltaburst. 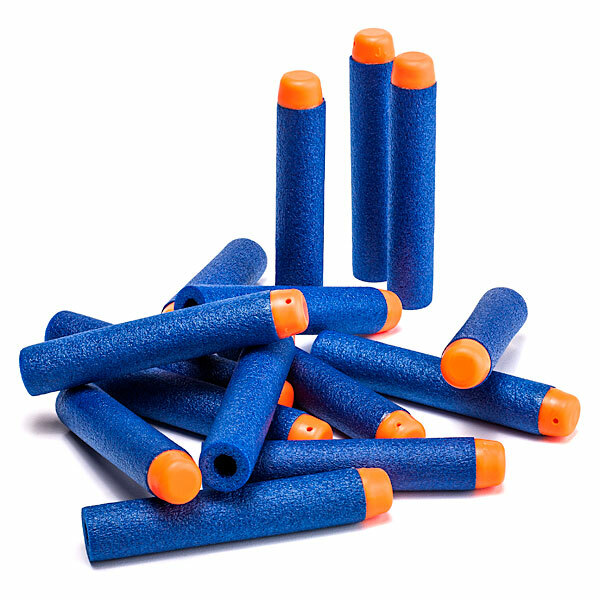 A fun and exciting way to Battle without shooting Nerf darts or worrying about reloading quickly. The Nerf Laser Ops DeltaBurst blaster gives players everything they need to face off in head-to-head live-action laser battles! The DeltaBurst blaster fires a multi-shot IR (Infared) burst while the Alphapoint fires a single IR shot. With each pull of the trigger each Laser gun registers hits with lights and sounds, and displays health status and ammo capacity. Both blasters have unlimited ammo and a quick-reload button to replenish supply. Nerf Laser Pro Ops works awesome during the day or at night! If you are interested in a particular date feel free to email us or click on the "Book Your Party" tab and submit the dates that you are interested in. We generally reply within same day.